Fiddleheads grow wild along riverbanks and streams in New England in the spring after the rivers have receded from the snowmelt. Fiddlehead Ferns are actually an immature Ostrich fern. The taste resembles a cross between asparagus and dandelion greens. When the heads pop out of the ground in the spring, they are tightly furled (resembling the end of a fiddle). They are an excellent source of vitamin A and a fairly good source of vitamin C and fiber. Although fiddleheads will keep for 2 weeks in the refrigerator, they should be eaten quickly as possible to maximize their fresh, delicate flavor. To prepare fiddleheads, trim the base of the ferns and bring a small amount of lightly salted water to a boil. Wash fiddleheads and simmer them for 7-10 minutes. Serve at once with melted butter or vinegar. Fiddleheads can also be steamed or sautéed until tender. They can be substituted for asparagus in most recipes. 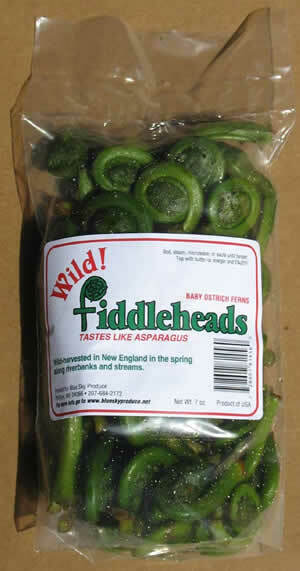 Fiddleheads from Maine are usually available the first week of May to the first week of June. 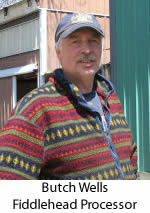 Blue Sky Produce only takes wholesale orders.